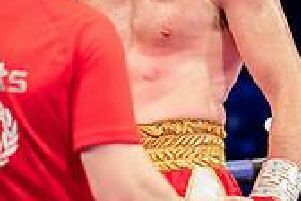 Liam Cameron says he is in prime condition as he puts the finishing touches to his game-plan to retain his Commonwealth middleweight title in his home city of Sheffield. The 27 year old Manor Park champion made weight at the iceSheffield venue which will host his Friday night battle with Nicky Jenman, who failed his weigh-in test. Cameron hasn’t fought since taking the title of fellow Sheffielder Sam Sheedy last October. “I wish I’d been more active, I’d box every month if I could” he says. “Eliott Matthews twice pulled out on me and then I was going to fight Curtis Woodhouse, but that didn’t happen either” he said. Brighton boxer Jenman is listed as a southpaw, although Cameron is unsure whether he will fight in that stance or go orthodox. “It doesn’t bother me if he goes southpaw, I think I have stopped every southpaw I’ve boxed, apart from Wayne Reed. Cameron has a lot to live up to - he put Sheedy down five times in last year’s win. “Sam said he’d never been put down in amateurs or the pros before and I did that to him” said Cameron. Cameron doesn’t draw any undue confidence over the fact that Jenman has been stopped five in 10 defeats in his 31 fight record. “Wasn’t that in his earlier days - and since then he’s had a winning spree? Jenman, arrived late at the scales for the weigh-in at iceSheffield and was over the limit in his first test. Cameron labelled his opponent as “fatty” as Jenman failed for a second time, coming in a pound over. The southerner can’t win the belt now, but if Cameron loses, it becomes vacant.